Royal Oak is pleased to announce the launch of The Nigel Seeley Fellowship with the National Trust. Established by Katherine Singley of Decatur, Georgia, the fellowship will provide training and educational opportunities for individuals with a professional interest in the preservation of historic interiors, finishes, and collections. It is named for the National Trust’s Head of Conservation, Dr. Nigel Seeley (1989-2002), under whom Katherine studied. The fellowship will be awarded to professionals spanning careers from conservators, heritage craftsmen, collection managers, to environmental engineers, lighting specialists, and pest specialists. Located in Sevenoaks, Kent, Knole is a unique piece of cultural heritage that sits in a beautiful and well-used deer park just off Sevenoaks High Street. Built as an Archbishop’s palace and transformed into a lavish Jacobean country house by the Sackville family, six centuries of history are contained in one of the largest houses in England.The Inspired by Knole project began in 2012, funded by the Heritage Lottery Fund. It is one of the National Trust’s largest ever conservation projects. The purpose of this project is to protect Knole and its collection “forever for everyone” and also demonstrate to visitors to Knole how conservators preserve history through conservation, both preventative and interventative. During the last four years, Knole has been under-going a program of essential repairs. The Inspired by Knole project, running through 2018, includes building an on-site conservation studio and learning space to conserve and share Knole’s fragile collection; opening up new spaces in the house; restoring and improving the Brewhouse cafe; and transforming the visitor experience within the showrooms. This project will broaden the National Trust’s community engagement work, creating new opportunities for local people to engage with the property through volunteering, programmed activity, and an enhanced and more diverse visitor experience. 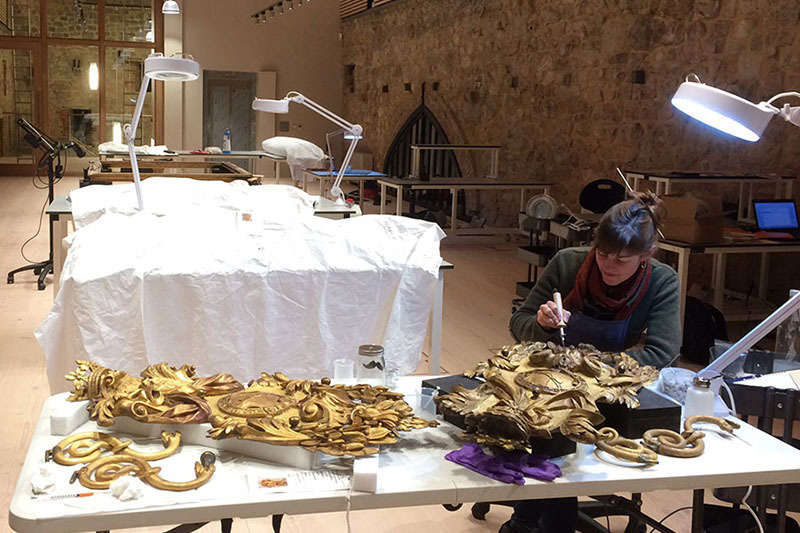 The new Conservation Studio sits at the heart of Knole. This facility is an important asset for the National Trust, Kent and the South East region. From the summer of 2016 to 2019, the studio will conserve a large percentage of the collections from Knole House. Gilded frames and furniture form a very large component of these collections. Established in 2016, the fellowship provides training and educational opportunities for individuals with a professional interest in the preservation of historic interiors, finishes, and collections. The fellowship will enrich young professionals’ lives by offering first-hand experience of the National Trust’s world-class techniques, houses, and collections. Named for the former National Trust’s Head of Conservation, Dr. Nigel Seeley (1989-2002), the fellowship is awarded to professionals spanning careers from conservators, heritage craftsmen, collection managers, to environmental engineers, lighting specialists, and pest specialists. The fellowship joins Royal Oak’s established Damaris Horan Fellowship. Both fellowships provide talented Americans the chance to gain hands-on experience through the National Trust’s expertise and renowned educational training. Fellowships will be offered biennially, alternating years between each prize.